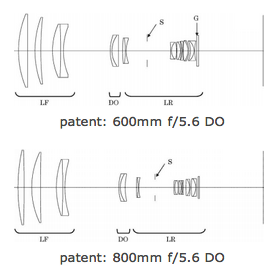 There is a new Canon patent filed in Japan with calculations for a 600mm and 800mm f/5.6 DO lenses. Similar to Nikon's AF-S 50mm f/1.8G lens Canon is also rumored to announce a new EF 50 f/1.8 IS lens. There are some new rumors that the upcoming Canon mirrorless camera could have an APS-C sensor. This entry was posted in Canon and tagged Patents. Bookmark the permalink. Trackbacks are closed, but you can post a comment.